I didn’t get a chance to finish the post I had planned for today so I am reissuing some handy (updated) info from last year that I’m sure only a few have seen and/or remember. I’m sure many of you will be traveling during the holiday season – whether on vacation or to visit friends or family. I’ve accumulated a few tidbits and treats that hopefully will make your excursions and gift giving a bit easier and more fun. If you’re interested more in treats, then scroll down a bit further! If you haven’t already purchased your tickets, there are many sites and apps to help you. Hipmunk is a great new tool. It may not look that different when you start, but once you enter your information, your choices are quickly (no endless wheel here) presented to you in an easy-to-read-and-compare grid. Unless you have a tiny screen, there is very little need for endless scrolling up and down. Not to mention, hipmunk has already screened out the very undesirable options like flights that are wildly more expensive or have way too many stops. I was going to offer you a little video here that gives a bit more information about the app, but in researching that, I actually came upon something even more interesting. So bear with me while I digress (this is the beauty of the internet no? – the endless links where you always find more than you expected). One of the founders of hipmunk is a young man named Steve Huffman, who has also been involved in other internet start ups, including reddit, a social news website now owned by Conde Nast Digital. He cofounded that site with Alexis Ohanian. Last year Alexis spoke at TED, the idea conferences that I have mentioned before. I loved his presentation – a very short, funny, really terrific piece illustrating the power and egalitarianism of the internet. I think you’ll like it too. So – back to travel. Next on our list is iFLY.com which is a website and now also available as an app for your iPhone (ifly at $3.99 or iflypro at $6.99). You may already know it but I just discovered it, even though it’s been featured on the Today Show, in the NY Times, and voted by Travel & Leisure the “most comprehensive airport guide” (Nov 2009). iFLY is exactly that – a comprehensive guide to over 500 different airports. You can actually plan and purchase your trip here as well as find out the more predictable information like your flight number, whether or not your flight has been delayed and information on baggage claims. But what makes this interesting is all the ancillary information particularly the terminal maps including restaurants, shops and terminal services (banks/ATMs, business centers, currency exchange, etc), what types of ID you will need for your destination, what the baggage weight limits and standards are, tips on how to travel with children and pets and even info on where to park your car while you are gone. As you are making your reservations, a clever site to consult before you click the buy button is SeatGuru. This is simply, as they say, “the ultimate source for airplane seating.” This handy site has 700+ seatmaps for commerical planes, backed by 25,000+ flier reviews, explaining which are the good seats and which are best to avoid. I wish I had used this when I was coming back from a wedding in Aspen this summer. I was so excited that I had scored the bulkhead seats, thinking how pleased my tall husband would be. Little did I know that our side of the plane had a wall immediately in front of us, eclipsing the leg room to less than even regular seat status. Once your destination had been determined, there are several handy sites to help you get the most from your trip. The first is Approachguides. What a fantastic site – what they offer are “cultural travel guidebooks that take an in-depth look at key sites throughout the world, drawing connections among their history, art, and architecture.” Right up my alley! These guides are like miniature history/culture classes that are deep and well researched. Best of all, Approach Guides are available as both PDFs and eBooks, allowing you to leave your bulky travel books at the hotel. They can easily be printed out or viewed on your iPhone, Blackberry or iPad. They are not free (range from $3.99 to $7.99) but can be previewed for free before you purchase. Be sure to visit their site where you can read about the other interesting ventures creators Jennifer and David Raezer are involved with. The second site is stay.com. This clever site allows travelers to create their own travel guides by assembling information available on the site such as hotels, attractions and restaurants into one handy place which can then be shared with friends or family or printed out in a compact guide. It includes unbiased hotel reviews from previous guests and up to date information on cities around the globe. Chances are you may have seen or at least heard of the Luxe City Guides. They are the super chic, cult, entertaining city guides that no self respecting stylish travel guide round up could be without. Here’s the brief backstory that will impart a bit of the flavor of these witty volumes. “Nine years ago the founder of LUXE City Guides, Grant Thatcher, was at a party in Singapore. He was told that if he were ever to go to Bangkok, then he must be sure to take the several A4 pages that he was now being handed, as they contained the best insider knowledge on the city. Everybody, it seemed, loved this saucy list. Grant looked at the list. It seemed familiar. It looked exactly like the list he had written for friends before he left Bangkok. Shut up, and get out of here! Dong! It’s true. The rest, as they say, is history.” And as if they weren’t fabulous enough already, they are now available as apps for the iPhone. With your fee, comes a year of free updates sent directly to your mobile and when the year is up, you can subscribe again for half price. For those looking for a great gift for a travel lover, the Luxe City Guides Handmade Boxes would make the ideal present. Just take a visit to their psychedelic site to check out all the options. Two other chic travel gift/guide options are available on the fashionable front. First are the Wallpaper* City Guides which “present a tightly edited, discreetly packaged list of the best a location has to offer the design conscious traveller…the best restaurants, bars and hotels (including which rooms to request) to the most extraordinary stores and sites, and the most enticing architecture and design.” Compiled by the hip magazine’s travel experts, they are available as individual titles, boxed book sets divided into themed World Cities groupings: Art Fairs, Beach, Business or Fashion (love these themes!) or as apps on the iPhone app store. But I have to say that Louis Vuitton takes the cake for the most creative, elegant and varied offerings. Their City Guides have become staples among the cognoscenti. The chic urban traveler would most definitely appreciate the new 2012 European city boxed set, which includes 9 paperback guides exploring 30 cities. And not just capital cities but unexpected ones such as Beirut, Courchevel, Gstaad, Oxford, Palma, Porto Cervo and Thessaloniki. Only the chicest distinctive hotels, restaurants, galleries and fashion stores are included in the 7,000 addresses. The new additions this year are Bari, Birmingham, Odessa, Salzburg and Zagreb. 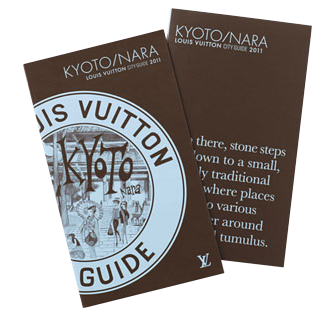 There are also individual City Guides offered such as this Kyoto and Nara covering 600 hand-picked addresses, including authentic inns and ryokan, tea houses, temples and shrines, period villas and secret zen gardens. It also suggests fabulous getaways in the Kyoto and Nara area. New this year are Hong Kong and Macao , while London, Paris and Rome are totally revised. In addition, Vuitton has added charming video previews that you can watch online. Here’s the the latest for Hong Kong. Also fun is a City Guide Postcard Box with 100 postcards representing 100 world cities designed by talented artist Ruben Toledo, who also illustrated the New York City Guide. A fun gift to remember for almost anyone on your list. 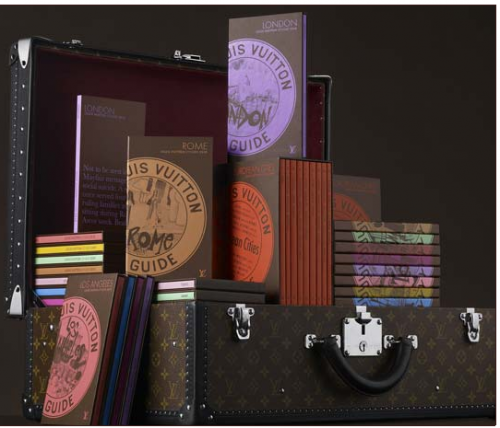 Less known are the other two series in Vuitton’s travel book collections that are equally gift worthy. The little spiral bound Travel Notebooks combine famous artist’s sketches of major cities, information about points of interest, along with the location of the Louis Vuitton shop nearest the landmark. For example the London notebook includes watercolor illustrations by Aurélie de la Selle of spots fom Sloane Square to Chelsea. 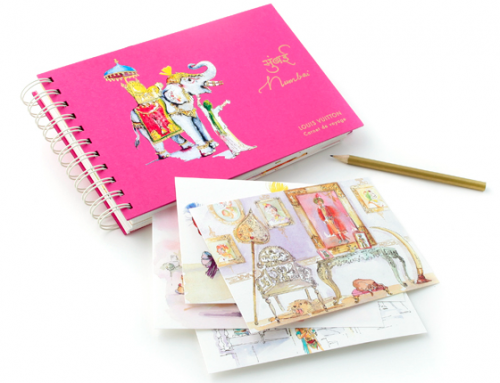 The Sydney notebook features Australian painter John Wolseley’s interpretations of their architecture and beaches, while the Mumbai notebook below contains Florine Asch’s illustrations of elephants, maharajahs and Indian interiors. The notebooks conveniently include blank areas for your own sketches and observations, along with a pencil in its own holder and a supply of postcards. Truly a charming gift indeed. And certainly no one will be surprised to learn that (the idea of) this last series is probably my favorite. There is however, a bit of bad news. It is available only in French. So if you know someone who can read French and is an armchair traveler, this is most definitely the gift for them! 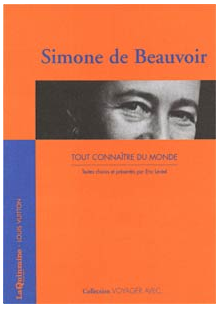 Vuitton’s “Voyage Avec” series, published in association with ‘La Quinzaine Littéraire,’ “presents the often little-known travel writings of famous literary figures, including Marcel Proust, Simone de Beauvoir, D.H. Lawrence, Karl Marx and Joseph Conrad.” There are 27 titles in the series, each of which sounds enticing. I think we should all write Vuitton and demand – um excuse me – request that this series be translated and published in English as well – I know I would be willing to commit to all 27! So to all of you going somewhere this holiday season – travel safely, and enjoy!! This entry posted in books, design, gifts, holiday, learning, louis vuitton, travel. Entry Tags: Hipmunk, IFly.com, Louis Vuitton City Guides, Louis Vuitton Travel Notebooks, Louis Vuitton Voyage Avec, Luxe City Guides, Seatguru, Stay.com, Wallpaper City Guides Bookmark the permalink. I am staying put this year but this made me want to hop on a plane to go and discover an exotic locale! Beautifully presented, as always, Stacey! Nice post, q. Wish I was flying to Paris, London, or Italy for a Christmas jaunt, but I guess the beach will have to do, lol. Hope that you are having a great week. Slow down and smell the roses. Stacey What amazing travel tips!! Many I am sure I will use! No trips in the works for us for awhile, but all these tips having me wanting to plan our next adventure and start parking. 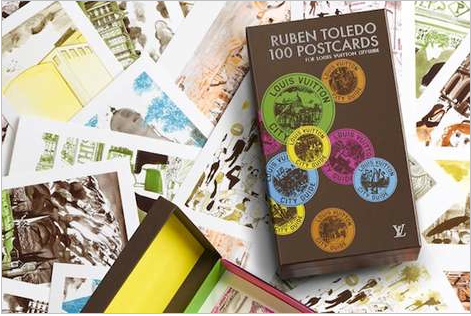 I had never seen the Ruben postcards for LV – would love to get my hands on them! Wow, that sounds great! You will have a great time. I will be traveling with my family this Saturday actually! Cant wait! Love the travel tips! I used to travel a lot in December (it was my only free month of the year) but this year I am staying cozy and close to home. Love reading and dreaming about traveling though, lol! I use Fare Compare. It took me ages to find it, but I like the feature of seeing my flight prices on a calendar, so I can pick my travel days. I just linked you in my blog. I am encouraging readers to fight the trend of covering their books in decorative parchment/uniform papers. I like snooping through my friends bookshelves and seeing what they read. You are the person to weigh in on the subject. You are what you read! Have I missed anything? Thank you Stacey for including us in your post! I am so glad that you enjoy Approach Guides. Also it seems that we have very similar tastes — I have fallen hard for Hipmunk (which we just used to book our trip to Bangkok) and off of your rec, will be buying Vuitton’s “Voyage Avec” series for a friend! Thanks again! I just spent waaaay too much time on stay.com(new to me)…thanks for all the great tips!! I love the little pink travel notebook! I think it would make a lovey gift…to me!! Wonderful tips….makes me wish I traveled more! I just added something to my Christmas list. These city guides for the design conscious are fabulous!!!! What a great idea and I can’t believe I haven’t heard of them. I hate wasting money on a typical chain hotel when I could have a unique, aesthetically charming destination! It’s just hard to find the time to investigate everything yourself. Perfect! Thanks for sharing this!!! I love this post. We love to travel and I love gadgets! I wanted to take my time to read all your descriptions and let it sink in. 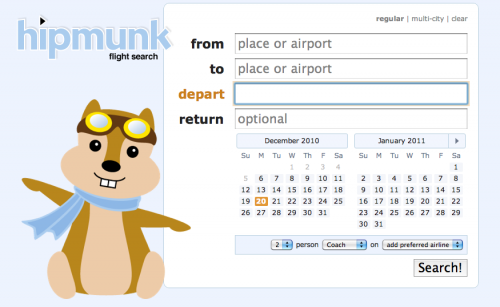 I am off to check out Hipmunk.com to see about flights for this summer! I like to plan ahead! 78 queries in 0.549 seconds.